Our exclusive collection of Kurtis has been designed with perspective, of the latest fashion statement.Some of the items include Ladies Designer Kurti,Ladies Designer Party Wear Kurti, Ladies Casual Kurti and Ladies Party Wear Kurti. 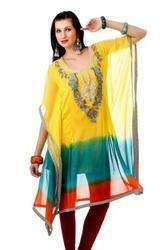 Ladies Fashion Top Tunic Kurti. The offered range of top tunic kurtis is hugely acclaimed among clients for its striking patterns, attractive designs and stylish look. This trends tunic are so comfortable to wear, paired with a super skinny jeans or leggings and leather booties. The oversized, slim fit and loose top/dress makes looking good effortless (for those lucky enough to have the right body type for this look). Western clothing fashions always have perfection and step up within the measures of dressing either for women..... This is a latest Tunic Fashion dress consists of skinny jeans in navy blue color and a fabulous sleeves with rough and baggy style of neck type which gives casual touch to this dress. All such types of dresses are basically for casual use….. These are available in Indian ethnic style and fabric ornamentation. Designed beautifully with work of traditional embroidery along with a modern contemporary feel. Our collection is a nice combination of Indian fabrics and English colors. However, each top is different from the other and has its own unique style This latest trends in designer wears and kurtis tunic westerns. We are the manufacturers and exporters of Indian ethnic wear, tunics and kurtis which are in high demand all over the world. Western fashion and therefore, we aspire to blend the tradition of India with that of Western culture...... . the Indian designer kurtis is that they can be worn with jeans, Patiala, leggings, harem pants, trousers and even skirts. For every function or occasion you can blend it with any combination and make it suitable according to your personality and choice. Designer Booyhood style party wear Tunic Kurti top. This latest trends in designer wears and kurtis tunic westerns. We are the manufacturers and exporters of Indian ethnic wear, tunics and kurtis which are in high demand all over the world. Western fashion and therefore, we aspire to blend the tradition of India with that of Western culture..... This is a latest Tunic Fashion dress consists of skinny jeans in navy blue color and a fabulous sleeves with rough and baggy style of neck type which gives casual touch to this dress. All such types of dresses are basically for casual use…..